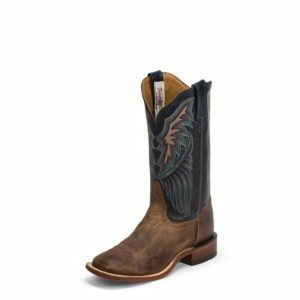 The Tan Saigets is a 11-inch tall San Saba™ women’s cowboy boot with character. The smooth black leather upper provides a simple backdrop to the vibrant multi-colored winged stitch pattern along the upper and features a scalloped collar for subtle elegance. Its distressed golden brown vamp sports a broad square toe and a walking heel with a spur ledge that allow for a relaxed fit in the stirrup. The Cushion Comfort Package has a steel shank for maximum support and durability and offers a scored insole for improved flexibility and stability with a poron foam layer that provides instant comfort and cushioning. 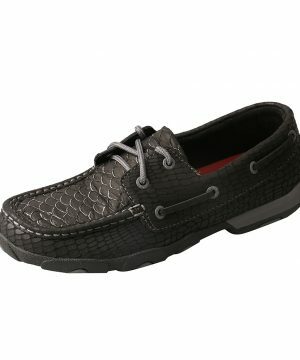 Its double stitched welt allows for durability. This style is proudly Handcrafted in the USA.